TOP What is VCCI? Hi! I'm EMI! I’m from a star named ITE where radio environment is good. Look at my chest. This is the VCCI mark to prove that I passed behavior test of VCCI on the planet earth by having trained myself hard. So I am trusted to do an important job for VCCI. What job? It is to keep radio environment clean enough for people to enjoy undisturbed use of their mobile phones, TVs, radios, personal computers and the like by conditioning the balance of uninvited electromagnetic emissions from information technology equipment. It is an amazing thing that people can keep comfortable use of their ever increasing electric and electronic appliances in homes and offices! 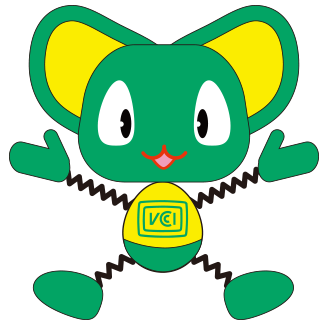 It is since 1999 that name Emmie has been frequently used in medeas such as video and brochures as the symbolic VCCI character as it is implicative as EMI (Electro-Magnetic Interference) and EMISSION. I am elastic from 2000 meters (wave length of 150KHz to 5cm (wave length of 6GHz). My height elasticity may further increased by training I am continuing. This is a symbol of my achievement through a hard training. But I cannot be content with it because there is no end to the training.